Sometimes, for an album to be considered a “classic,” it needs a narrative. It needs a story behind it more than something as mundane as “Artist goes into studio with collection of songs and records those songs.” A little undercurrent of some sort that attaches itself to the music will help it stick with people long after its release date. Pablo Honey: The album with “Creep”, but also the album before they became Radiohead as we know them. 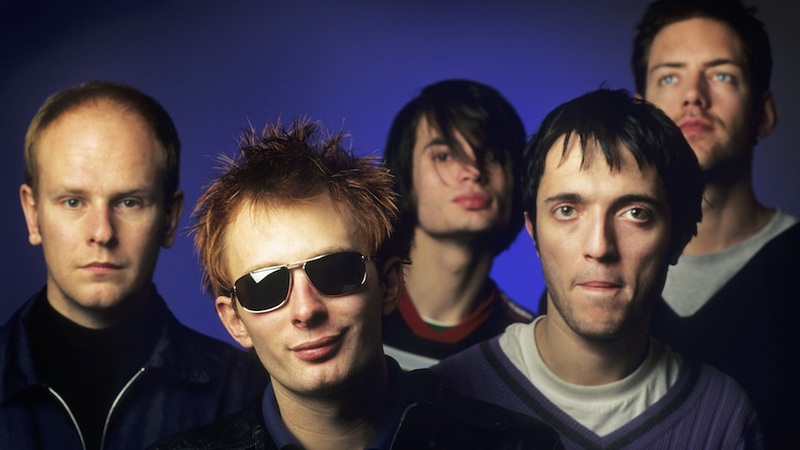 The Bends: The album where they become Radiohead as we know them. Kid A: The album where they tore down everything about their previous masterpiece and made another masterpiece in the process. Amnesiac: Kid A’s weird but compelling tagalong cousin. In Rainbows: The album that they gave away over the internet to revolutionize the process of music distribution. King Of Limbs: The album equivalent of the band clearing their throat. A Moon-Shaped Pool: The victory lap. Related: “The ’90s Grunge Scene: When Did It Actually Die? Conspicuously absent from that list is 2003’s Hail To The Thief. I’m not sure if you can attach any kind of a narrative to that album. It does indeed seem like it was made with no other intention than being a continuation of the recording cycle, a need for the band to flex their recording muscles so that they wouldn’t atrophy. There’s no underlying theme besides the usual Radiohead trope of hope attempting, usually unsuccessfully, to peek out from beyond the dread. (A few songs hint at the political tenure of the day, but not much more than usual for lyricist Thom Yorke and certainly not enough to deem this a “concept album”.) And there’s nothing really noteworthy about the recording of the album, just a quick stop in LA with producer Nigel Godrich to bang it out. Maybe that’s why Hail To The Thief is somewhat overlooked in the Radiohead catalog. Yet I would argue that it is the band’s finest album since Kid A and that it ranks only behind The Bends, OK Computer and Kid A in their list of albums. That puts it #4 out of nine from the best band to start their career after 1990, which means that it is a stone-cold classic. If you wanted to label it in some way, you could say that it rocks more furiously than anything that the band had previously achieved, with that sound of the guitar plugging in at the start of the album being a harbinger of things to come. But that doesn’t take into account the quieter detours like “I Will” or “Sail To The Moon” that are every bit as affecting as the thumpers. Certainly, with the electronics used more as embellishments for the songs rather than the main focus, the album is a wonderful showcase for Radiohead’s instrumental chemistry. Remember that only two years had passed since the release of Amnesiac when Hail To The Thief was unleashed. And yet they had amassed a pretty impressive batch of songs in that period, songs which show them at their most restlessly inventive. From moment to moment, you don’t know what’s coming next on the album, and that’s part of the rollercoaster thrill of it. Hail To The Thief really hits its stride in the final four songs. “A Punchup At A Wedding” is one of their funniest tracks ever, a slyly funky recounting of a fractious family get-together. “Myxomatosis”, which features a relentless whiplash groove, finds a way to make a rabbit disease insanely catchy. The band then pulls back for “Scatterbrain,” which finds them capturing that place where calmness and unease meet like only they can. Finally, there’s “A Wolf At The Door”, where Yorke updates Bob Dylan’s “Subterranean Homesick Blues” rap with much more sinister undertones (watch out for that “flan in the face”), only to gild the whole affair with a soaring chorus. It’s probably not fair to say that anything that Radiohead has ever done is quite underrated, as critical love is something on which the band has always been able to rely from The Bends on forward. But it feels like Hail To The Thief gets lost in the shuffle a bit, if only because the only thing you can say about it is that it is heady, challenging, exhilarating music. In other words, par for the course for these guys. In “2+2=5,” the album’s cacophonous opening track, Yorke screams out, again and again, “You have not been payin’ attention.” Maybe you’re one of those people who has been sleeping on Hail To The Thief for all these years, but, trust me, attention must be paid.